7 individuals, forming 5 teams, attempted the All Stations Challenge – to catch trains which stop at each of the 176 stations on the Sydney Trains network at least once in a single day. 3 teams returned to Central at the end of the night, though 1 of these failed to reach Doonside Station. The 2 teams, both individuals (one of which being the author of this blog), who completed all 176 stations did so in 17 hours 0 minutes and 17 hours 20 minutes. A live blog from that day, updated as events unfolded, can be seen here. The rollout of Concession Opal Cards, currently planned for 5 tertiary institutions in the new year, appear to have been delayed by privacy concerns. These concerns were raised by a Sydney Morning Herald article, which has now been withdrawn. The Premier Mike Baird had previously stated that Concession Opal Cards would be available by O-Week 2015. This gives Transport for NSW until the end of February to reach a deal with other institutions, including the University of Sydney, UWS, and UTS; none of which have yet agreed to a deal with Transport for NSW to give out Concession Opal Cards to its students. @BeauGiles The #Opal rollout for tertiary students will begin in time for O-Week next year. Today I will be taking part in the All Stations Challenge. This post will be updated throughout the day, sporadically. For updates throughout the day, check my Twitter feed @bambul or using the hashtag #AllStationsChallenge. A live blog of my previous attempt can be found here. 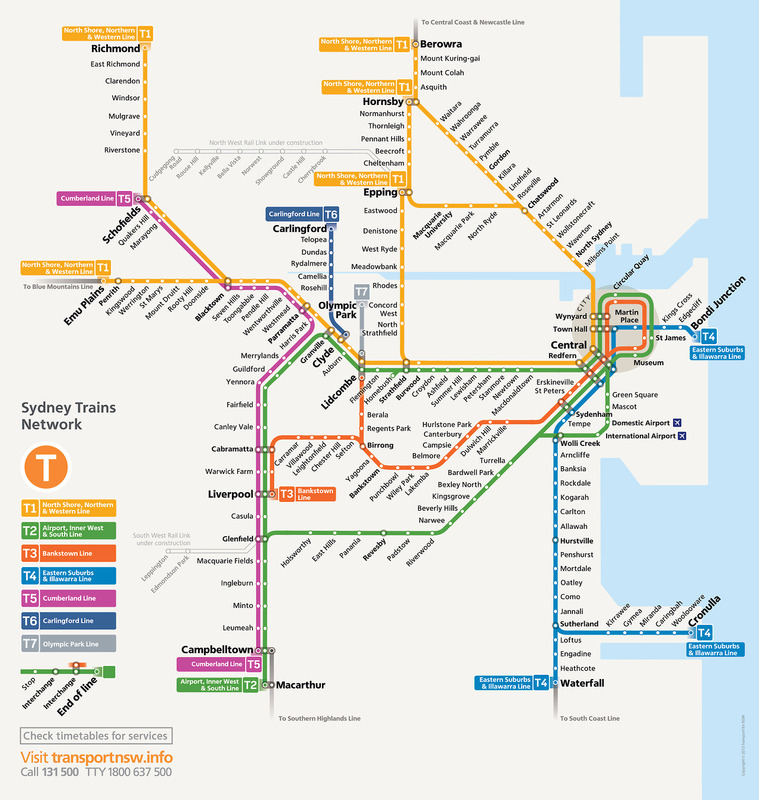 My current plans will have me completing the entire Sydney Trains network (176 stations) in a bit under 17 hours. It begins at 5:33AM, with the key points being at 3:36PM, where I am hoping the train to Richmond is running late, in order to give me enough time to make the mad dash across Blacktown Station. If I miss that connection then I will need to watch out for 7:34PM, where I have to run from the Sprint platform at Lidcombe to catch another train arriving at the same time as my train that recently departed from Olympic Park. Below is a rough plan for the day. 12:05AM – While checking my plan in bed I notice that my arrival time at Granville is actually the time I arrive at Merrylands. This means I miss my planned connection. Some furious last minute amendments gives me a new plan of 17 hrs 25 mins, rather than the original 16 hrs 25 mins. If the Emu Plains train is running late then there is a chance I can still catch it and achieve the original time. The good news is that the only problematic time is now 10:46AM-10:48AM at Town Hall, where I need to transfer from the T4 Eastern Suburbs Line to the T2 City Circle. If I miss that, then I can still do the City Circle at the end of the night, adding a few minutes to my time. This is a very acceptable variation. Unfortunately, this has also robbed me of precious sleep time. I will be doing this on about 3 hours of rest, less than I’ve had in previous attempts. 5:11AM – Made it to Central. My first train is the 5:33AM to Homebush. That will complete the Inner West Line. 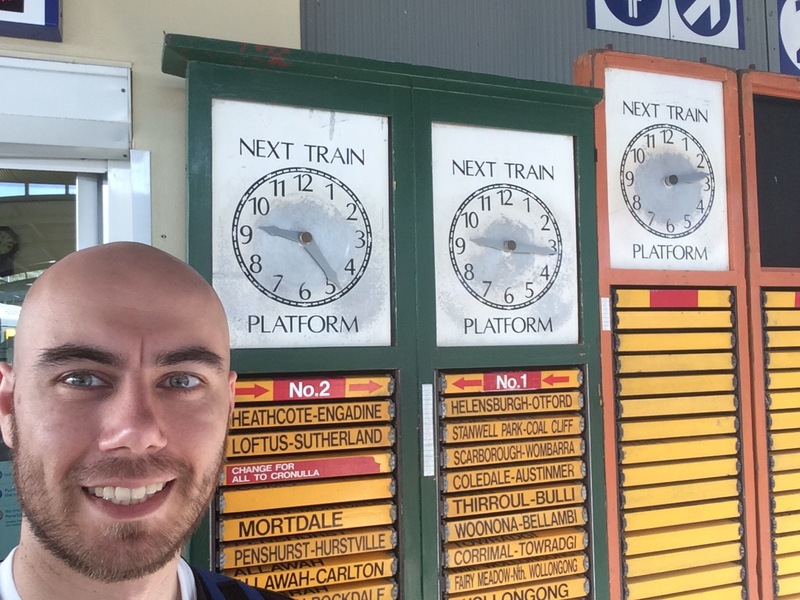 5:27AM – After meeting up with John, Leam, and Jake, I head off to platform 19. Along the way, I bump into Craig. That makes 5 of us so far, though I believe there will be 8 in total. 6:00AM – Made it to Homebush. The train ended up being 2 minutes late and real time data is not working. I really hope it gets back up soon and stays up as I will be relying on it to gauge any tricky transfers or changes to my plan. The next train is the 6:17AM to Lidcombe. 6:26AM – The 6:17AM train was important as it is one of the few that stops at both Homebush and Flemington, thus preventing backtracking and saving some time. Arriving at Lidcombe I make a quick transfer from platform 4 to platform 5 for a T3 Bankstown Line train back to the city. It gets to Redfern at 7:14AM. After that I head South towards Hurstville, in the counter peak direction at the start of the morning rush hour. I will need to cover the Sefton portion of he Bankstown Line later today. 7:24AM – On a T4 train to Hurstville after changing at Redfern. From Hurstville it’s another train to Cronulla, then backtracking to go to Waterfall. A return trip to Bondi Junction will complete T4 entirely. No major issues yet, though the first major challenge for the day will be a 10:46AM arrival at Town Hall from Bondi Junction, which leaves only 2 minutes to get to the 10:48AM City Circle train on the other side of the station, requiring me to go up 2 floors and down 2 floors again. 9:07AM – Having completed my journeys to Cronulla and Waterfall I begin my 17 minute wait for the return train to Bondi Junction. 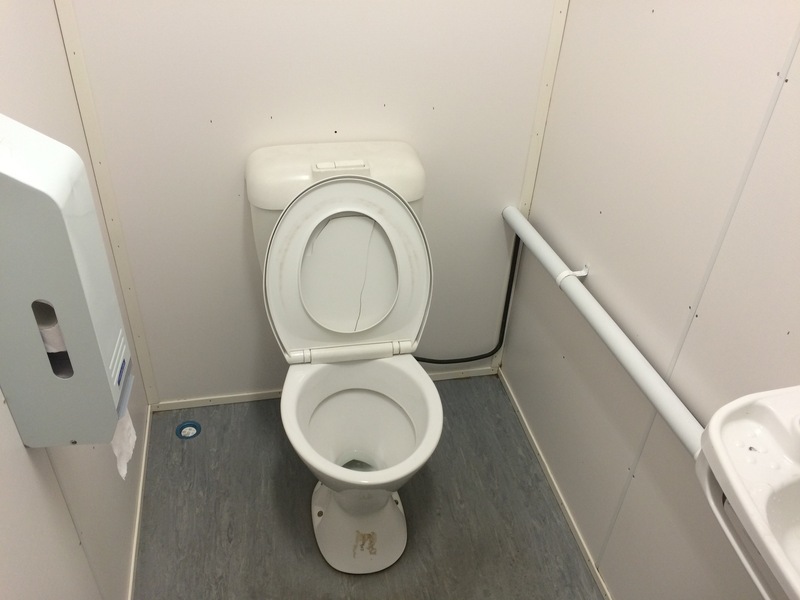 Thankfully, there is a toilet at Waterfall, and it couldn’t have come at a better time! Actually, perhaps half an hour earlier would have been slightly better, but I digress. So far I have visited 55 of the 176 stations, but the long trip back to Bondi Junction means this tally won’t rise much for another hour or so. 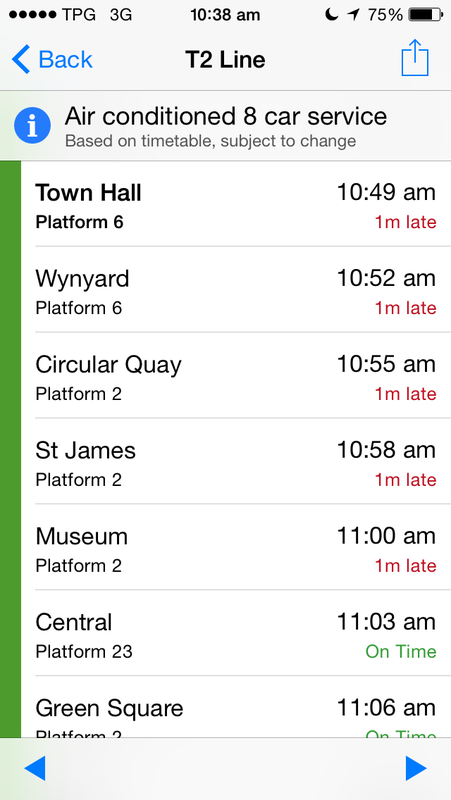 After Bondi Junction comes the 2 minute dash at 10:46AM in Town Hall. 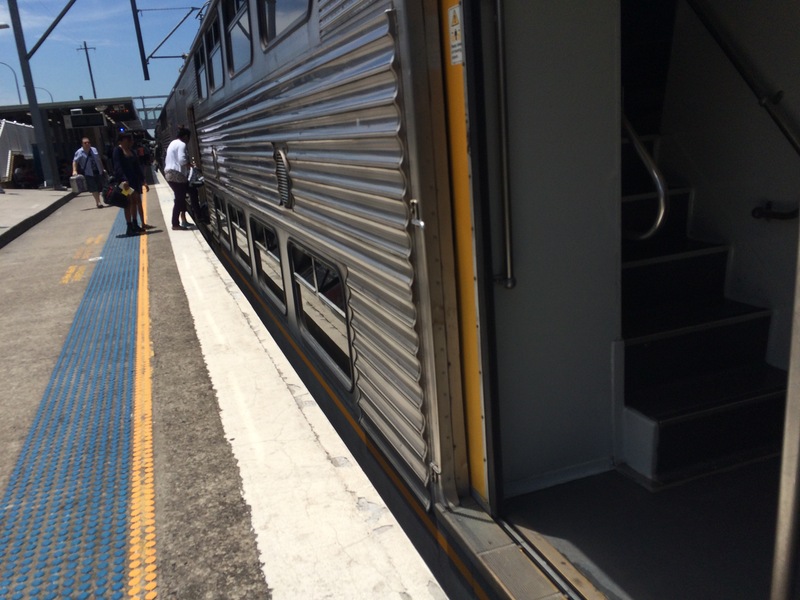 10:30AM – The train ride to Bondi Junction took just over an hour. A quick dash to the other platform for the train that was waiting there should get me back to Town Hall. 61 stations visited out of the 176. 10:38AM – The train is scheduled to arrive at Town Hall at 10:46AM. Real time data now says the other train is running 1 minute late, which gives me 3 minutes to run up and then back down to the other platform. 10:47AM– That was a lot easier than expected. It’s now smooth sailing until 2:10PM! 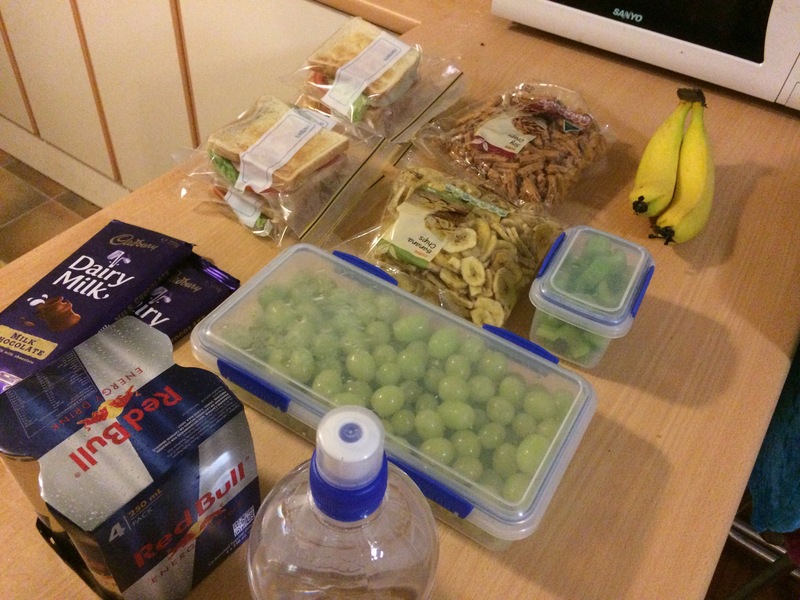 11:38AM – Arrive at Revesby. Not the easiest transfer as it requires crossing to a separate island platform. But I was after some photos. 11:41AM – On the next train to Macarthur. 12:15PM – Macarthur is the 88th station, making this the halfway point to 176 stations. It has been almost 7 hours and there are still well over 9 more hours to go, probably close to 11 hours. At this point I’m still hoping the Emu Plains train is at least 3 minutes late when I get to Granville. That also relies on my train being on time. 1:23PM – Waiting at Cabramatta for 16 minutes in the middle of the day is a reminder of how hot it is outside. Having been inside an air conditioned train for most of the day, I almost haven’t noticed. To make it worse, an S-Set comes to take me to Sefton. There are few of these still in service and they are the only remaining trains without air conditioning. 2:08PM – Today’s critical point approaches. My train arrives at Granville at 2:13PM. But I want to catch the Emu Plains bound train that is scheduled to also arrive at Granville at 2:10PM. If I make it, then I finish at 10PM. If I don’t, I finish at 11PM. 2:13PM – I was never going to make it unless the other train was seriously late. The Emu Plains train actually blocks off access to the platform for my train, and so my train was not going to be able to get to Granville until the other train was long gone. It’s unfortunate, because it was a simple cross platform transfer. Now, instead of heading towards Emu Plains, I’m remaining on my train until Lidcombe. Next up are Olympic Park and Carlingford. 2:35PM – I ran for the Olympic Park train, but it was well and truly gone by the time I got there. Had I reached it, I might have opened up some other options, but I was unaware of it at the time. This is the second S-Set for the day and I am getting really hot. I’m now down to just my white bonds shirt. 2:43PM – I briefly consider dashing for a Richmond train, abandoning my plans for Carlingford. But then I realise that I have misread the timetable and that this particular train had already left Lidcombe Station before my train had arrived. Back to the standard plan. 3:43PM – The return trip to Carlingford is done. All that is left now is T1, which will take about 6 hours. 112 out of 176 stations done. 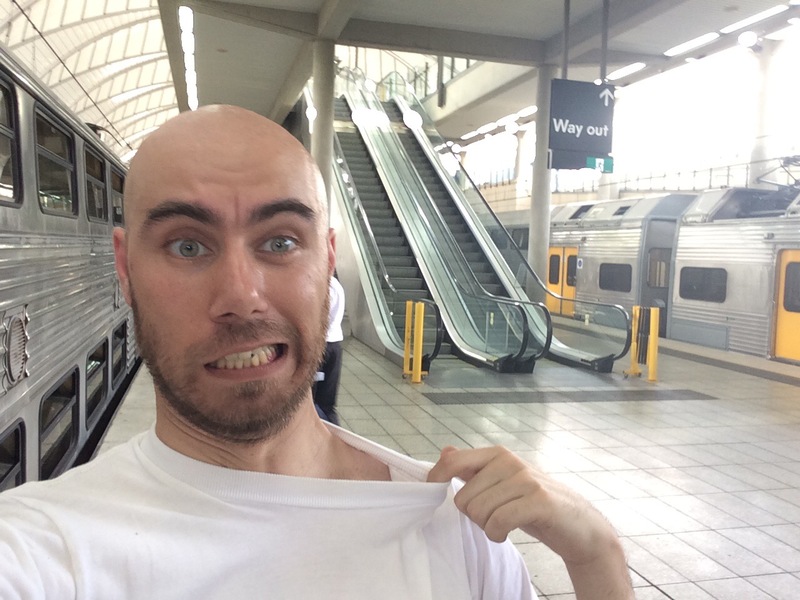 4:00PM – I’ve reached Parramatta and am ready to take an express train to Emu Plains. An incident at Wynyard has caused disruptions near the city, but the Western portion of the network seems quite unaffected. 4:55PM – I spoke too soon. Trains going into Richmond have been delayed by 40 minutes or so. I am going to be delayed by about half an hour at this point. 4:59PM – Having made it back to Penrith from Emu Plains, my train to Blacktown has now been delayed by 10 minutes and will depart at around 5:09PM. I am running low on battery, so I’m turning off my phone and working from my iPad for a while. 5:09PM – The train is now an express, presumably to help it make up lost time. I need to stop at all those stations I missed by taking an express up to Emu Plains, so I’ll have to wait. 5:15PM – I’m being informed that the incident was a fatality. It has really affected train services. Those delays have pushed out West and are now hitting this part of the network. 5:20PM – An all stations train arrives, set to leave at 5:26PM. It is about 27 minutes later than my originally planned train, but I still need to see what happens around Blacktown for the Richmond train. 5:21PM – The train leaves early! I am now only delayed by 22 minutes. 6:28PM – After a quick changeover in Blacktown I am at Richmond. My current ETA for completion is 10:58PM, ironically the same ETA before all the disruptions from the fatality at Wynyard (not to mention the freak rainstorm). However, the train schedules remain very unpredictable, so that finish time could blow out, or potentially even narrow slightly too. There is no longer much choice in terms of where or when I go, so I just have to ride this out and let luck play its part. Battery life is also starting to strain. My iPhone is on 20% and has been turned off. My iPad is still on 30% and I will probably run it down until there is none left, then turn the phone on again. It also appears that I had previously forgotten to count Sutherland, so I have completed 1 more station than I had originally anticipated: 134 out of 176 stations done. 6:50PM – Approaching Blacktown Station. Very hard to predict timetable changes at this point, they keep changing. Trains are routinely running later or earlier than was earlier predicted, and this has delayed my ETA to Central back to 11:28PM. I am now expecting to reach Strathfield at 7:47PM. 7:38PM – Approaching Strathfield. ETA is now 10:28PM, but it requires two very tricky transfers. First, I need to go from Strathfield’s platform 4 to platform 6 in under a minute. Strathfield has ramps but no stairs, so moving from one platform to another in a short space of time is quite a challenge. If I manage that then I need to do a 0 minute transfer from Epping’s platform 2 to platform 5. This requires going down 2 sets of escalators (easier than going up, but still very tricky). 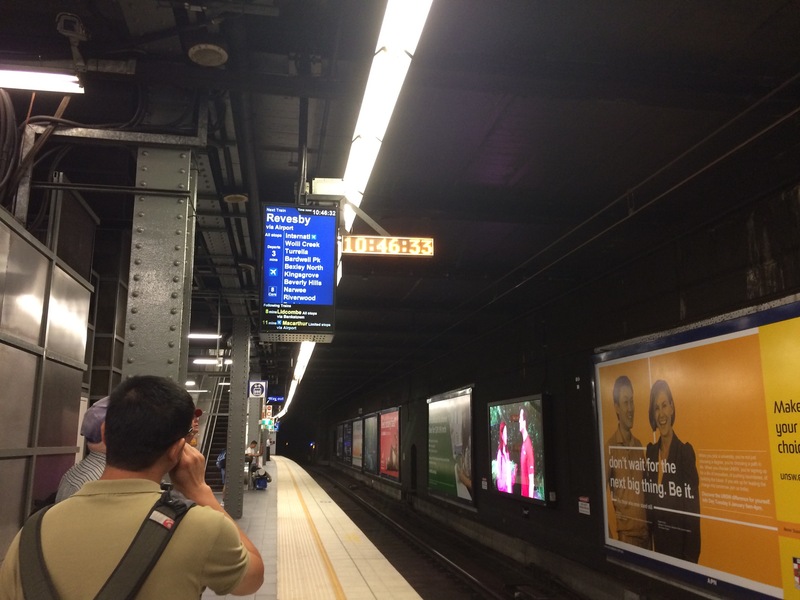 7:43PM – Train arrives at Strathfield about 8 minutes earlier than anticipated. I will easily make the 7:51PM train to Epping. 7:57PM – The 7:51PM was an extra 6 minutes late and is now the 7:57PM train to Epping. I can kiss that 0 minute transfer goodbye. 8:04PM – The butterfly effect is at play. The earlier closure of Wynyard meant that City bound trains from the North Shore were all bunched up and delayed going into the City. They eventually all made it through and out West to Richmond, Penrith, and Blacktown. These trains are now all returning through the City and up North. Because of the irregular schedule, they are very hard to predict. However, all the bunching up also gives me a rare commodity at this time of night: high frequency services. Ordinarily in this situation, I would take a train from Epping to North Ryde, then another train back up to Hornsby, before finishing up the rest of the North Shore Line in one go from Berowra to Milsons Point. However, that big gap in the service I mentioned earlier means that there are few trains going from Epping to North Ryde right now. So instead I’m going to take one of the frequent Epping to Hornsby trains to complete the Northern Line. I can’t take my current all stations train all the way to Hornsby because these trains all terminate at Epping. Hopefully, by the time I reach Chatswood and have to do the Macquarie Line from there (rather than Epping) there are plenty of trains going in both directions. This will remove a long waiting time that currently exists if I head towards North Ryde now while services are infrequent. 8:32PM – Made it from Epping platform 2 to 6 in the 1 minute required. Am going North now, rather than South, under the original plan that required 1 minute to reach platform 5. The train I just got off had been delayed too much for the plan to be an option anymore. 8:46PM – I reach Hornsby. Both my train (Northern Line) and the train I needed to transfer to (North Shore Line) were running late and were held waiting before reaching Hornsby. By a stroke of luck, my train was allowed into the station first. After speaking to a train guard, they have informed me that the delay is due to a large number of trains being temporarily stuck at Hornsby. These trains are using up platform space, preventing other trains from entering Hornsby. These stuck trains are here because of all the delays – staff have finished their shifts and have gone home, but with not enough available staff to replace them. As a result, they sit there while we wait for staff to arrive to drive the trains back into the city. But until that happens, some trains cannot enter Hornsby Station. In this case, I was lucky. The next train will take me to Berowra, at which point it turns around and heads back to the City via the North Shore Line. I will be getting off at Chatswood to complete the 3 stations on the Macquarie Line, then heading into Central. 153 out of 176 stations done. 8:54PM – I reach Berowra. Current ETA is 10:50PM. 157 out of 176 stations done. 10:02PM – With Macquarie Uni done I get on a Chatswood terminator almost missed it, and in fact completely forgot that these were still running. I had expected to wait 15 minutes for a direct train into Central. Instead I will be able to get a connecting North Shore Line train to Central. ETA is now a very respectable 10:37PM. 171 out of 176 stations done. 10:33PM – My train arrives at Central a few minutes early. That makes it an even 17 hours 0 minutes. A quick dash to the Sydney Terminal concourse to where the big clock is and I get my celebratory photo. I had expected to complete this challenge in 17 hours 25 minutes. If I got lucky with my Granville connection, then it might have dropped down to 16 hours 25 minutes. But I missed that connection and was hit instead with major delays. To have then managed to bring the time down to 17 hours 0 minutes is something I am quite proud of. Doing so is where this challenge comes into its own. When things go wrong, you re-evaluate your plans, take into consideration the layout of the network, and use the changes to your advantage. A similar thing happened to me last time I attempted this in 2013, and I was able to complete the network in 16 hours 39 minutes by taking advantage of the disruptions. 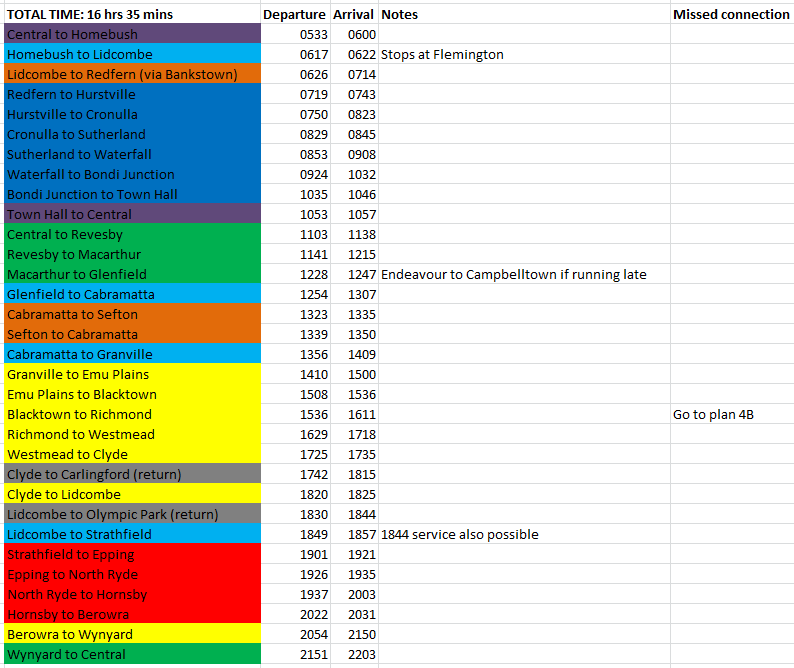 Finally, a quick overview of the different trains sets I caught during the day. If I caught the same train twice (such as an end of line terminating train which I caught back in the return direction) then I only counted it once. Opal Card readers have been installed and activated across all of NSW; trains, buses, ferries, and trams are all now Opal enabled. The Opal rollout began in December 2012 and was set to be completed in early 2015. Over 1.4 million Opal Cards have been ordered or issued. Concession Opal Cards, the only type still not available, will be available early in 2015 for university students. Opal Cards for children and pensioners became available earlier this year. Modifications to the CBD and South East Light Rail (CSELR) will see two trams coupled to form 67m long vehicles, while 3rd rail technology will be utilised within the CBD to allow for catenary wire free operation. Previous plans had 45m long single vehicle trams utilising batteries to operate within the CBD. “The proposal offers services that from day one carry up to 15 per cent more light rail passengers in peak hours, and 33 per cent more seats across the day” according to the Transport Minister Gladys Berejiklian. 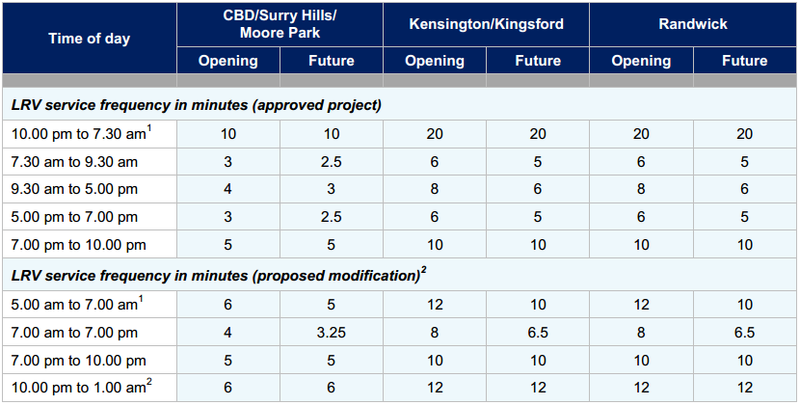 Changes will also see the World Square stop scrapped, an underground access tunnel will be introduced for the Moore Park stop rather than a two storey design, while the Randwick Racecourse stop will be shifted to the North of Alison Road. Changes to the Racecourse stop will require customers to cross Alison Road to reach Randwick Racecourse and may interfere with the recently built bike path along Alison Road. Though longer vehicles will see higher overall capacity added, it will also see a slight reduction to frequencies during peak hour, from a tram every 3 minutes to a tram every 4 minutes in the CBD (trams in each of the Randwick/Kingsford branches will be half as frequent as in the core CBD section). However, frequencies will be improved during the late night and early morning hours, from a tram every 10 minutes to a tram every 6 minutes in the CBD. This will ensure 12 minute frequencies in each of the 2 branches, rather than 20 minute frequencies. The modification report stated that “20 minute headways…were not consistent with Transport for NSW customer service obligations”. UPDATE (9:57PM, 7 December 2014): Tandemtrainrider99 points out in the comments that, though 67m long trams would be amongst the world’s longest, Sydney would not actually have the world’s longest trams. He points to the San Diego Trolley, with its 3 vehicles coupled together at 72m in length. This is slightly longer than Sydney’s proposed 2 vehicles coupled together at 67m in length. A few of these can be seen in the video below and might give an insight into what George St may look like in a few years.